Are you having large sized PST files in your MS Outlook profile and looking for something to break your PST files into multiple parts? SysInfoTools PST Split software is what you have been looking for. It helps you split your oversized PST file. 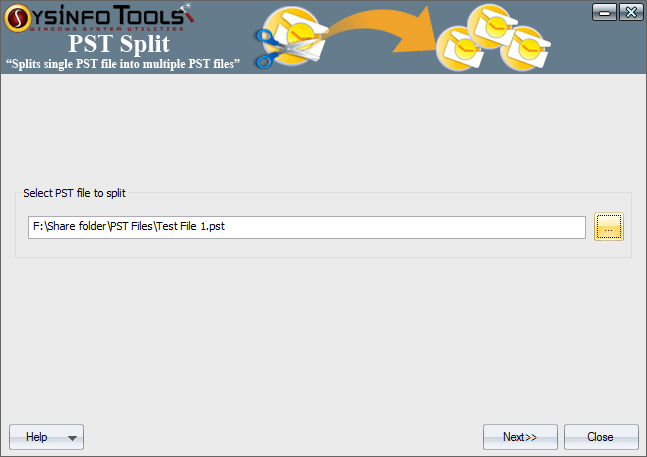 SysInfoTools PST Split Tool is the most recommended utility to manage oversized PST. Splitting PST file into smaller parts is one of the best ways to avoid Outlook file corruption. Regular use of Outlook may cause increase in data file size which exceeds the limit factor of PST files and prone to data corruption. Every PST file depending on the MS Outlook versions has certain file limitation factors. If this limitation exceed the factor, then there is a chances of data corruption. To overcome with the situation, user require to break large PST file into smaller PST files and fight corruption may result data loss forever. PST splitter software is very helpful for those MS Outlook users who are really worried about losing their curial data within the PST. The Software is powerfully programmed to split a large sized PST files into multiple smaller parts without causing any damage or alteration into the original data. It works as a non-destructive application therefore, all your selected PST files will be remained intact or unchanged. PST Split software of SysInfoTools is an easy-to-use application that requires no technical knowledge. Any technical and non-technical user can easily use this software. It offers multiple options to split a PST file, such as: split by Mail ID, split by Date, split by Size, split selected folders in single PST. It does not overwrite the original PST file in fact; it creates multiple PST files at user desired location. It also allows users to attach the new PST file in Outlook profile. The software supports all major versions of MS Outlook, such as: MS Outlook 2000, 2002, 2003, 2007 and 2010 and smoothly runs under all popular versions of Windows operating systems like: Win 2000, XP, 2003, Vista, Win 7 and Win 8. SysInfoTools offers free demo version of PST split software. Users can download the demo version and examine the performance of the software before buying the full version. RUsecure business continuity planning software simplifies your crisis management process with easy to use, easy to navigate, database driven software.